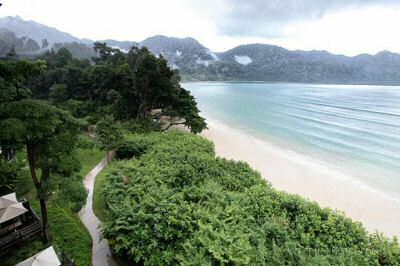 Datai Bay, on the north-west coast of Langkawi, is an exclusive stretch of beach for guests of the high-end resorts: The Datai Langkawi Resort and The Andaman. 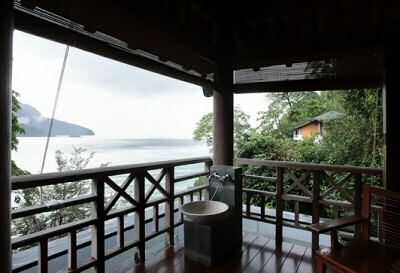 Datai Bay offers you a retreat for pampering in an oasis of tranquility. And at The Andaman Spa you can enjoy massages and therapies with an exotic view of the clear, cool waters around the Langkawi and the beautiful islands that rise in the distance. For the more adventurous, you need to know that there is hardly anything else to do than to relax, stroll to the Datai Langkawi Resort or rest on the beach and take it all in. Other than that, be prepared to crack your brain over the following choices: beach or pool? snorkel or dive? smoothie or cocktail? ... :-) Nearby after a jungle walk you could visit a crocodile farm or put some holes in one of the 10 best Golf courses in Malaysia: the Datai Bay Golf Course. 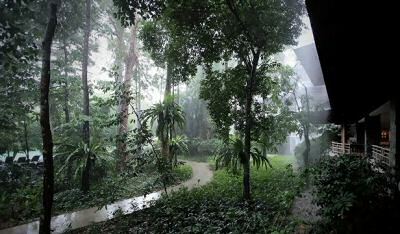 For more activities, you need to venture out at least 7 km to find the nearest attraction, being the Langkawi Cable Car. But if you want to be high up in a more peaceful surrounding away from all the tourists, just book a spa in the Andaman Langkawi Spa. A buggy from the Andaman resort will drive you high up to the 5 private suites that offer you an amazing view over Datai Bay and the Andaman Sea. Try the seaweed baths, the volcanic mud or an eye mask with roses. Datai Bay is about 30 km or half an hour drive north of the Langkawi International Airport. It is not advisable to hire a bike and drive to the Datai or Andaman resorts, as the roads become quite steep and are more suited for seasoned professional bicyclist than for people that want to relax and enjoy on the beach.